GRAND RAPIDS, Mich. — Switch, a globally recognized leader in future-proof data center design, superscale cloud, unparalleled telecom gateways and energy sustainability, today announced the opening of the largest, most advanced data center campus in the Eastern U.S. –– Switch GRAND RAPIDS, home of the iconic Switch Pyramid. The campus, designed for up to 1.8 million square feet of data center space and up to 320 megawatts (MW) of power, marks Switch’s strategic expansion across the country to serve major key markets including Chicago, Ashburn, New York, Washington D.C. and Toronto, all just milliseconds away. The entire campus is powered by 100-percent green energy, cementing Switch’s leadership in sustainably running the internet. 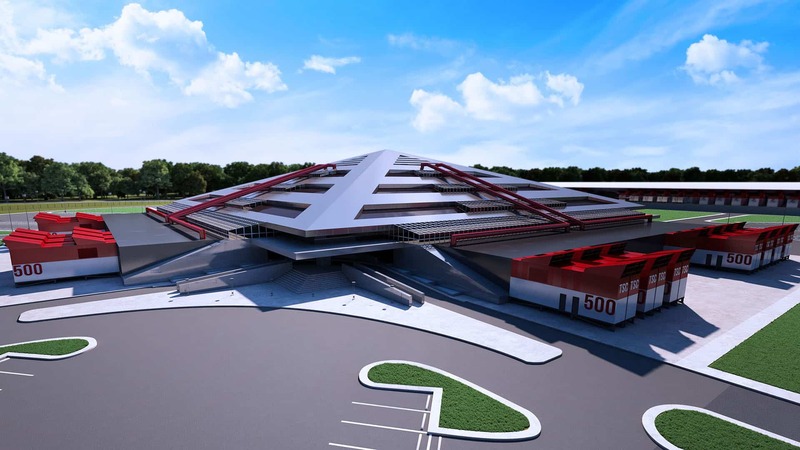 The first phase of construction is an adaptive reuse of the Steelcase Pyramid into the Switch Pyramid data center designed to include over 225,000 square feet of data center space. It is developed to the same world-renowned Tier IV Gold-rated standards as the company’s Las Vegas multi-tenant data centers. Based on more than 260 patent and patent-pending claims developed by founder and CEO Rob Roy, Switch data centers continue to exceed all industry standards. Like all Switch data centers, the Switch Pyramid is designed to accommodate future-proof, high-density deployments, high-performance workloads and always-on applications across a wide spectrum of industries and technical requirements. During the accelerated construction and development schedule over the past year in Grand Rapids, led by local general contractor, The Christman Company, more than 700 people have been employed at the site in construction and mission-critical positions. Almost 99 percent of these workers are Michiganders, reflecting Switch’s commitment to support local economic development by hiring from the local workforce. Switch expects that hundreds more people will be employed as the campus is built out. State lawmakers who were instrumental in attracting Switch to Michigan praised the opening of the Switch Pyramid campus. The Right Place, the economic development corporation for the Grand Rapids area, sees the establishment of the Switch Pyramid campus acting as a catalyst for the growth of the tech sector in the region. Switch expects to hold an official “grand opening” event at the Switch Pyramid later in 2017.